Federal Minister for Families and Social Services, Paul Fletcher and Liberal candidate for Wentworth, Dave Sharma, today announced $186,000 to community-run organisation Our Big Kitchen to continue serving the most vulnerable across the Sydney community. The announcement was made before a group of women from WIZO Rachel who were attending the Kitchen to bake challahs. 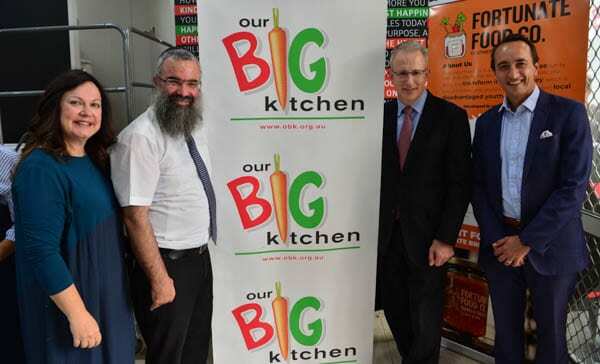 Our Big Kitchen is headed by Rabbi Dov Slavin and his wife Laya is a community run, non-denominational, industrial kitchen where meals are prepared to distribute to vulnerable people across Sydney. Mr Fletcher said the funding would support the community kitchen to bring people together in ways that strengthen their shared identity as members of the local community – building social cohesion, a sense of belonging and importantly providing meals and services for those who need them. “The funding will assist Our Big Kitchen with organising its activities, volunteers and the programs it runs to support those who need a helping hand. “Our Big Kitchen’s successful programs such as its barista course for the homeless, cooking and hospitality classes, and a variety of social skills courses will benefit from this additional support,” Mr Fletcher said. He made special mention of OBK’s work in supporting those in need across a raft of backgrounds outside of the Jewish community. Liberal Candidate for Wentworth, Dave Sharma said the work of Our Big Kitchen is vital to the Sydney and Bondi communities. Dave Sharma told the WIZO ladies that he is well aware of the work which the organisation does with the disadvantaged section of the Israeli population. He sees the same value in the work OBK does in Sydney. “Last year Our Big Kitchen distributed over 80,000 meals to the most disadvantaged in our community and delivered these meals and services with respect and compassion,” Mr Sharma said. “Our Big Kitchen’s activities and programs help build social cohesion in the Bondi community through a facility that offers a place for people to come together and cook for a good cause, and feel included,” Mr Sharma said. Do Parliamentarians wash their hands before handling food at places like this excellent kitchen?